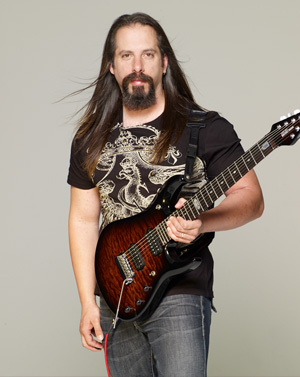 Originally from Kings Park, Long Island, John Petrucci began playing guitar at the age of 12. Though primarily self-taught, he attended Berklee College of Music in Boston in the 1980's, where he learned jazz composition and harmony. While at Berklee John hooked up with John Myung and Mike Portnoy, forming a band called Majesty (which would later be renamed Dream Theater). Dream Theater has recorded ten albums and has currently just completed a worldwide tour supporting the Systematic Chaos album. In 1999 John Petrucci and Music Man's Research and Design team collaborated on a new John Petrucci signature model guitar. Both 6 and 7 string models have since been fan favorites achieving worldwide success. 2006 marked the introduction of John and Music Man's newest version, The JP Ball Family Reserve. An upgrade version featuring a mahogany Tone block with Mahogany neck and Beautiful Maple top. This new BFR is John's main touring instrument and is available worldwide. At the moment John and Dream Theater are finishing up tracks on their yet un-named 11th studio release due out early Summer 2009.